The ruins of an old church at Eassie. South off the A94 between Forar and Meigle. 6'8" high, 3'4'' wide and 9'' at the sides. Upright rectangular cross slab, slightly pointed at the top. 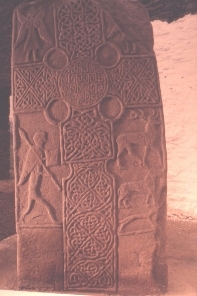 Front: Cross divided into six panels, each containing interlaced work, the centre of the cross has a key pattern. Stuart, J., The Sculptured Stones of Scotland 1st, Spalding Club, Aberdeen and Edinburgh (1856-1867) Plate 90. Volume 1Stone, Sculpture, Scotland, History, Archaeology.